Hunger is the second novel in Michael Grant’s Gone series, set in a town called Perdido Beach in California where everyone over the age of fifteen suddenly disappeared one day. In Gone, the first novel, the kids who were left struggled with fear of what was happening, and fights amongst themselves. Our hero Sam defeated the rival kids from the posh Coates Academy, who included his brother Caine, who he had never known about. Some of the kids, including Sam, inexplicably developed superpowers; there is also a strange being known as the Darkness living in an abandoned mine in the desert. Now, in Hunger, Sam has been voted mayor of Perdido Beach, having successfully resisted disappearing on his fifteenth birthday. But all is not well: as the title indicates, food has become scarce, and the kids are looking to Sam and his friends to solve all their problems. On top of that, Caine is recovering from his encounter with the Darkness and making plans again, and some of the “normal” kids in Perdido Beach (that is, those without superpowers) are getting angry, believing that the kids with superpowers aer keeping all the food and supplies for themselves. 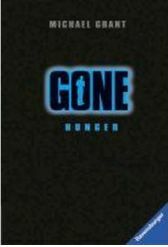 Gone was an addictive novel, and Grant has kept up the pace in Hunger, with no let up in the excitement and action. At the end of Gone we knew that food was going to be a problem, but it seemed like Sam would sort everything out. But in Hunger the tone is darker, with constant thoughts of food passing through the characters minds as they have to suffer hunger they have never experienced before, and live on food they would once have turned their noses up at. A smashed jar of hog dog relish, for example, is mourned by one character when he has no other food to eat. Sam’s feelings of being overburdened and helpless were present in Gone, but much more so in Hunger. He is constantly stressed, worried and almost panicky at times. He has no idea how to help everyone, especially when the kids don’t seem willing to help themselves by harvesting fields of vegetables. Sam no longer seems like the shining leader he became in Gone, and his outlook contributes greatly to the darker tone of the novel. Between this and the events of Hunger, it is hard to imagine any positive outcome for the FAYZ, or Fallout Alley Youth Zone, as the kids have christened the area they seem to be trapped in. Additionally, the Darkness is beginning to play a larger role. Caine and Lana, the healer, who both had encounters with it in Gone, can feel it calling to them, urging them to do its bidding. The Darkness is largely unexplained, though we do learn more about it in Hunger, and actually see it. It is the one element of the series which I am unsure about; it seems unnecessary, doesn’t entirely make sense, and I have little reaction to it. While showdowns between characters or the tension building in the human story make me desperate to read on, I find I want to hurry past the sections about the Darkness to get to the better parts of the story. These novels are aimed at young adults, and you can tell this from the style and language used, but for me the story overrides this – it is gripping, exciting and makes you think, and so it doesn’t matter who the intended audience is. I enjoyed Hunger almost as much as Gone, and I can’t wait to continue with the series. Definitely recommended to readers of young adult fiction, or those who simply enjoy a good story.